Here at Fifth Parlour, we’ve all been about concerts, shows, performances and launch of new records. Well, more exciting things are happening! This is the first play that The Fifth Parlour are having on our website. We’ve always been about promoting new artist, so come and support the local theatres! To all of you who’s looking for something new to go to, Miss C’s Little Blackbox Productions is presenting I’m All Left Turns (and I Don’t Know Which is Right) directed by Charis Vera. A Director, Musical director, Writer and Actress for both TV and Film, the wide range of projects she has embarked on has been staged and screened locally as well as internationally, her credits includes What Do Men Want (BananaMana Films- Outstanding Directing In A Drama Series at LA WebFest 2014 and Official Selection at Miami WebFest 2014), Tadpoles (Directed by Ivan Tan- Locarno International Film Festival 2013 and was also nominated for Other Film Festival Awards). She travelled to Bangkok as part of the cast that staged The Curious Lives of Shakespeare and Cervantes with internationally acclaimed playwright and director Asa Gim Palomera. 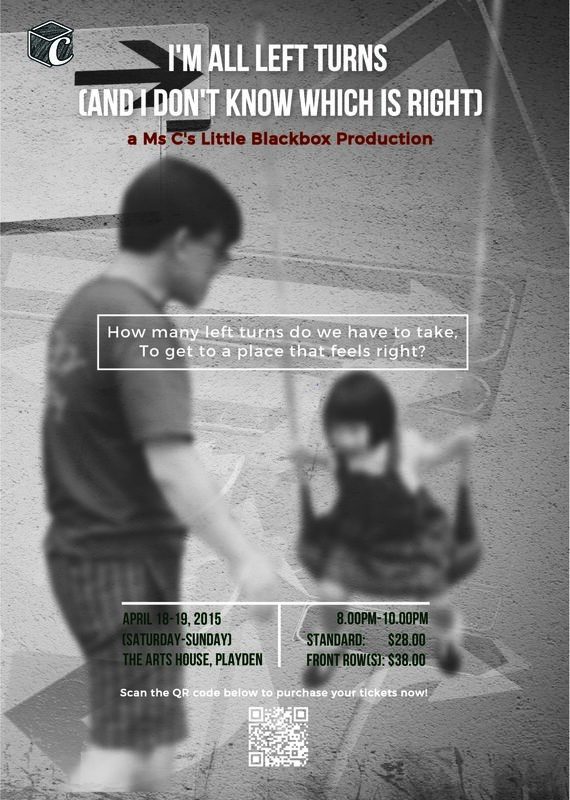 Charis Vera started Miss C’s Little Blackbox in 2013. Over the course of 4 months, her actors have gone through a gruelling and intensive actor-training program that includes use of yoga, movement, vocals and a derivative of Sanford Meisner’s Repetition. Their original piece is based off a 4.5hr horse-related exploring and devising workshop, where as a team, they embarked on a journey of a discovery leading them here- to what you see today. Imagine embarking on a task you don’t know how to do. Around you are other people who are trying to help you with that task, offer you advice, tell you what they think is best- except they might not always know what they’re doing either. Imagine also, that you’re blindfolded. Here, we look at the often untold stories that make up each person. We look at the struggles of parenting, the struggles of trying to be a good child, and how everything can feel like a stab in the dark. you can email info@littleblackboxproductions to reserve your tickets!